I am an art journaler, and mixed media artist, but never thought of myself as someone who could draw. I have always been… average at it. But you know, practice makes it perfect and we can all learn. This is why I bought myself a few sketchbooks and started to put my ideas on paper, not looking for perfection (this is key, especially for the Virgo that I can be sometimes !). But the covers can often be boring… this is why I love decorating mine. A few things to get in mind though: do I want to embellish once the sketchbook is done, or before I begin working in it ? it will determine if I use a lot of 3D items or not ;) For this one, It is 50% filled only, so I know the cover needs to stay flat. The Color Shots are so perfect when you want to quickly and easily color an embellishment, they are my favorite to use for that purpose. This is why I started my project by tinting some ribbon with the beautiful French Lilac Violet. The texture was glossy, so I began by mixing Super Heavy Gesso with Ghostly Gargoyle White Magical Mica (from the Haunted Halloween collection), to give it a subtle shimmer, and applied it carelessly. While still wet, I carved some symbols and stamped with a rubber stamp (it lifts the media and make a print). Once dried, I sprayed with Pink Ladie Pink Flat Fabio, all over. It’s the easiest way I know to get over the «fear of the white space». I wanted to add a stencil, with Pretty In Pink Pink but should have known better: wet on wet, when it comes to ink, means the stencil won’t appear. But I love how it turned out anyway. I embossed her hair with Byzantine Bronze embossing powder; the Versamark pen made it easier. It adds a very lovely depth that did not exist without it. I over-embossed it on purpose, to create even more texture (when there is too much heat, the gesso bubbles up). 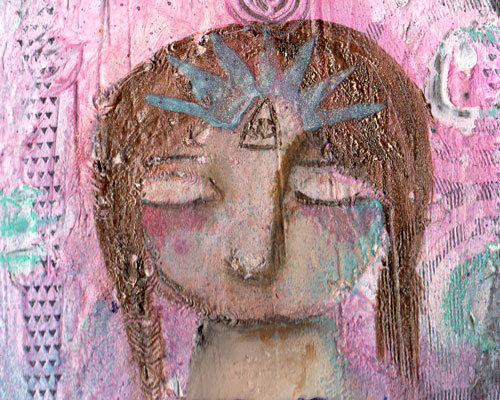 You know that I am in love with our glitters, and she definately needed to have a glittery crown over her third eye. So I decided to blend heavy gel medium with the Time Traveler Teal glitters that comes in the Industrial Chic pack. They are so fine and so versatile. I see a lot of possibilities to play with them ! Where to begin ? you can find one of our «mega set» so you have all the matching products from a collection (sprays, embossing powders etc). or find what you would use the most and start from there (this is what I did a few years ago. Now, I go for the mega sets because it’s a no brainer). Please, share what you’ll create. OMG you have really turned me on! I have always been a purest. Seeing you combine all those wonderful sprays, the embossing powder, and then the embossing powder blew me away! Always loved heavy gesso. Gives you so much dimension and depth. My problem where do I start? I want them all!